You can use diving shoes or diving boots for warmth and protection of your feet. With a diving shoe you run less risk of injury when walking in and out of the water over dikes, rocks and shells. For extra warmth you can use neoprene socks under your (diving) shoe. 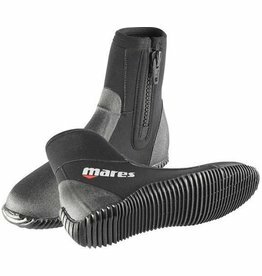 There are diving shoes for snorkeling, for diving with a wetsuit, sturdy diving boots for a dive with drysuit and swimming shoes to protect you in colder water from undercooled cloves.